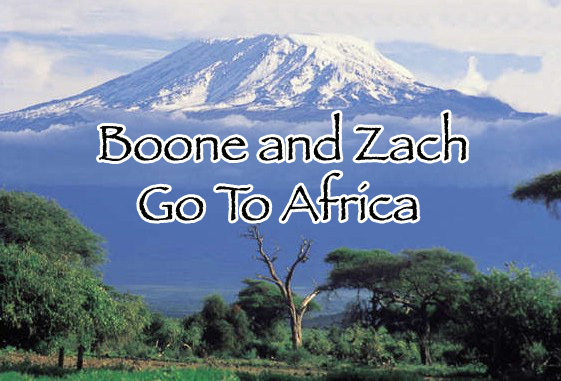 Boone and Zach Go to Africa: Welcome to Boone's Blog! My name is Joe (if you don't already know me) and I'm going to act as the administrator of this blog while Andrew is traveling. I'll hold down the site and make sure it gets updated and looks good so all Boone will have to do is update us on his adventures. Over the next few days, I'll post some background information about the places that Andrew will be going so we can all get a better idea of what he will expect to be seeing and doing. One of the coolest things about a blog is that Andrew can update everyone at once instead of sending out a mass e-mail. Anyone that we know can venture in here and learn about our boy Boone and the amazing things he's going to be doing in Africa. I am going to coordinate a "mailbag" segment in which you, the blog reader, will send in questions for Andrew about anything and everything related to his trip and he will answer them. If you want to e-mail questions for Andrew to answer while he is in Africa, send it to andrew.boone@bba05.mccombs.utexas.edu. The more questions you send him the more interesting and exciting his post will be. Please send me a message if there is anything you'd like to see added to the blog. I want to keep people informed the best I can so that we can know what Andrew is doing. love ya drew!! have fun saving the world!!! !